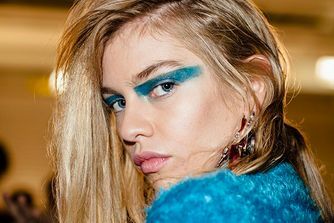 Statement liner is one of the most recent catwalk beauty trends to go mainstream, and this gorgeous Vivid Brights Eyeliner is the perfect way to sport it. Available in an array of rainbow hues, it’s a simple yet effective way to create a statement make up look – why not try ‘Violet’ or ‘Envy’ (green)? 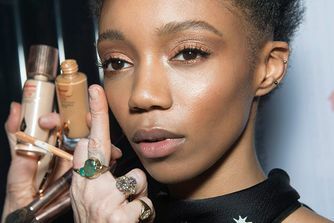 Use it to draw a subtle liner flick or a more elaborate design – plus, it can provide the perfect finishing touch to a statement eyeshadow look. But if you don’t normally wear shadow, it looks just as striking on its own. Give your classic 60s liner flick a colourful update with this Vivid Brights Eyeliner. The fine tipped pen nib creates the perfect cat eye flick with an intense pigment payoff. Choose from 9 standout shades, from pretty pistachio green (‘Escape’) and pastel pink (‘Petal’), to vivid electric blue (‘Sapphire’) canary yellow (‘Halo’) and vampish red (‘Fire’). Starting as close to the lashes as possible, draw a line at the inner corner of the eyelid and work toward the outer corner. For a more dramatic look, build width at the outer corners. Very pigmented and beautiful colours, but can be quite streaky. The liner is very pigmented, bright and fun - I love it a lot :). It's great for adding details or for a classic liner. Only problem is that it cracks if you layer it a lot. I have the yellow and purple version of this liner, makes your eyes pop and pigmented colours, however I found the yellow especially as time goes on begins to look like you've tipexed your eyes as it dries and cracks, nothing major and good value for money. Yeah, I bought the red one. Colour was amazing and I loved the look of my makeup that day! But the formula crumbled and just didn't last too long. Great for a pop of colour though. I loved the colour but the formula crumbled almost instantly.